October is National Seafood Month — a time to celebrate the ocean’s bounty, try some new recipes and perhaps some new products too! Stir together butter, shallot, zest, lime juice, chilies, and salt in a bowl. 1. Combine the tuna, sun-dried tomatoes, cheese, onion, parsley, capers and eggs in a bowl. Mix well and divide the mixture into 12 portions. Form each into a 2-inch diameter by 3/4-inch thick cake. 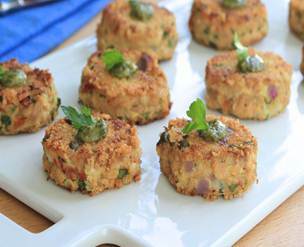 Place the breadcrumbs in a bowl and gently dip both side of each tuna cake in them to coat. Transfer cakes to a baking sheet. 2. Heat the oil in a large nonstick skillet over medium. Add the tuna cakes and cook until golden, 3-1/2 minutes. Carefully flip each tuna cake and cook 3-1 1/2 minutes longer. Transfer to a baking sheet covered with paper towel and drain. 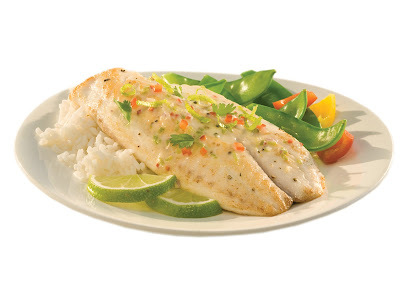 Transfer to a serving platter and top each with a dollop of pesto. I am always looking for tasty appetizers to try out and share with my family. These look easy enough to make and sound like they will be tasty too. Have you tried out the recipe?